This piece is part of a larger work entitled Project Blue Totem. Project Blue Totem is a personal video game idea that I have been working on for over two years. Up until my BFA exhibition in fall 2018, all I ever did was picturing and imagining the game in my head, and now I finally have a chance to realize this idea and have it debuted here. Blue Totem is a fantasy, RPG video game with a massive and diverse world setup. 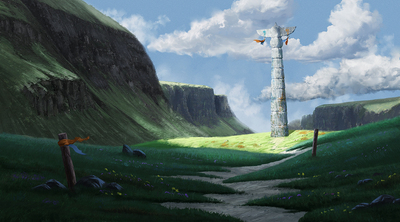 In this body of works, I focus on designing the early concept art of the game, environment, and scenes, specifically. My goal is to showcase some of the key areas and locations in this world, their environment, mood and atmosphere, cultures and stories. Each concept art represents some critical ideas about this world: wilderness, ancient ruins, mysterious, and magical locations and story related sites. Because of the epic fantasy theme, I had a lot of freedom designing these scenes; from the totem in the wilderness to mysterious underground palace, from the breathtaking iceberg to magical altar, every site is inspired by the locations in the real world, and I inserted more creative juice in them, pushed these ideas beyond reality. I want the world of Blue Totem to be intriguing and attractive, the locations have stories behind them, they are more than a landscape painting, background painting or a portrait, they are concept art. A concept art not only articulates an idea but also tells a story about the project, it represents the possibility and potential of the game, and thus it makes people want to see more and gives them the ability to imagine the world. It is my goal for this game, I want people to want to see more of the world of Blue Totem.